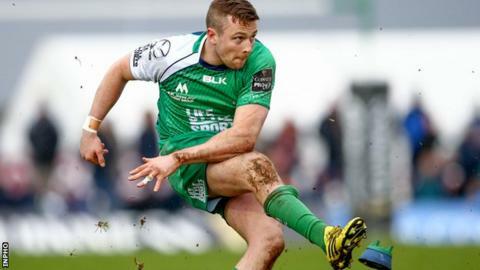 Connacht fly-half Jack Carty could be ruled out for up to three months after suffering a ruptured spleen while on holiday in Dubai. Carty, 23, sustained the injury in a waterslide accident and had surgery in Dubai on Monday to remove his spleen. Connacht coach Pat Lam confirmed the player could be out of action for one to three months, but that it is not a season-ending injury. The fly-half has featured in 17 of Connacht's 19 games this season. Lam explained the player thought he had suffered heavy bruising when the accident happened last week before it emerged the injury was more serious. His unavailability is a huge blow to Connacht's hopes of Pro12 and Challenge Cup success.